1. Heat 2 tsp of butter in a frying pan and add dry grated coconut, nuts and sugar. Fry it on a medium heat till sugar dissolves. 2. Add tutti - frutti and mix well till everything combines. Switch off the flame and allow it to cool. 3. Take 3 spring roll sheets as a base. Spread the coconut sweet mixture over the sheets leaving the edges plain. Cover this sweet fillings with 2 or 3 sheets and fix the edges by brushing it with some water. Slightly press the centre and the edges with your wet hands so that the mixture and the sheets are completely sealed. 4. Grease the griddle with some butter and gently place this sheets on it. Fry it on both sides till they turn light golden in color. 5. Cut it into desired shape with a pizza cutter or knife and serve warm. Note : Dry coconut or frozen/freshly grated coconut can be used. You can also bake this instead of frying on a griddle. 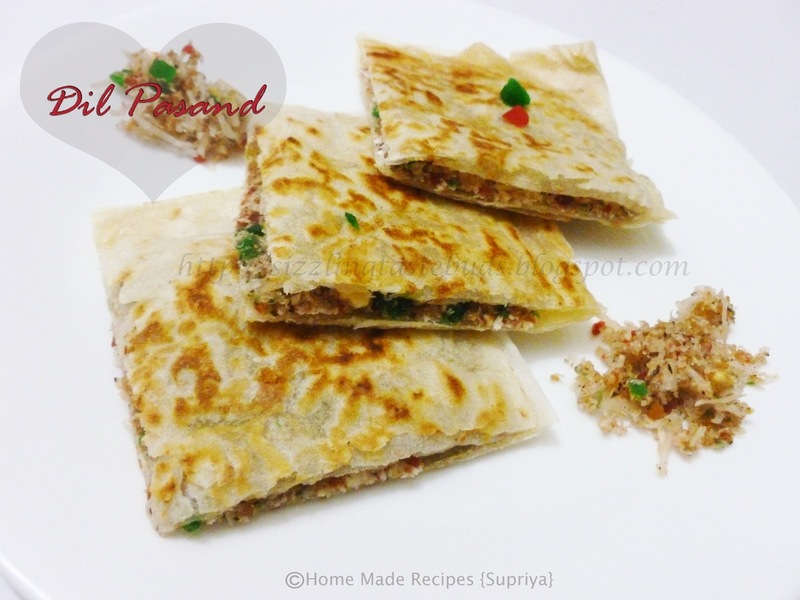 Thats a very unique idea of using spring roll sheets for making dil pasand :) Looks so delicious!! Very innovative way of making dil pasand. Looking good!